Out of Peach, a pinky peach creme polish with golden shimmer and matte hex glitter in gray. Isn’t it gorgeous? The formula is, as with all of these three, great and easy to work with. This is two generous coats plus top coat: Full Maroon, a dusty maroon hue packed with lots of sparkleness. I don’t think I have anything similar to this in my stash. It’s lovely! Definitely a perfect shade for Fall. Shown here is two coats plus top coat: Peahen Party, a bright purple hue packed with lots of different size and shape glitter in green, purple and even blue. You know I love purple so it’s no surprise that this is my favorite of these three. The formula is a bit thicker than the other two. I think that’s because there’s neon pigment in the formulation. We all know that those are a big pain in the behind to work with, let alone adding it to nail polish. And the big bonus: no fishing or re placing of the glitter needed! It spreads nice and even. So, thumbs up Brijit! 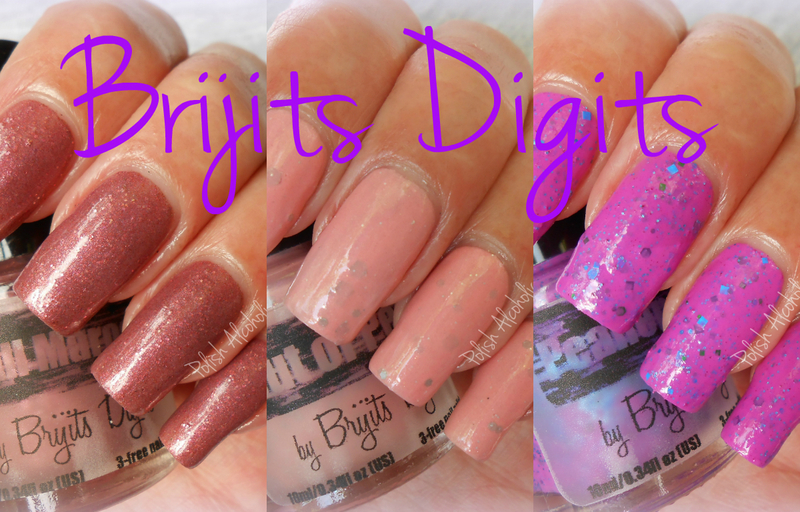 This is two coats plus top coat: Get your Brijit’s Digits polishes here! And while you’re there, I’d highly recommend to add one (or two or maybe three) of Brijit’s cuticle oil to your shopping cart! They are perfect and smell divine! Thank you Brijit for giving me the opportunity to try some of your creations! You rock! This entry was posted in Indie and tagged brijits digits, european indie polish, indie nail polish, indie polish by Polish Alcoholic. Bookmark the permalink. I really like Peahen Party! It looks awesome! Oh really does she? The look stunning! Thanks for sharing! Im eyeing the peach and blueberry creams that she has posted on her etsy! Peahen Party looks amazing, definitely my fave from the three.